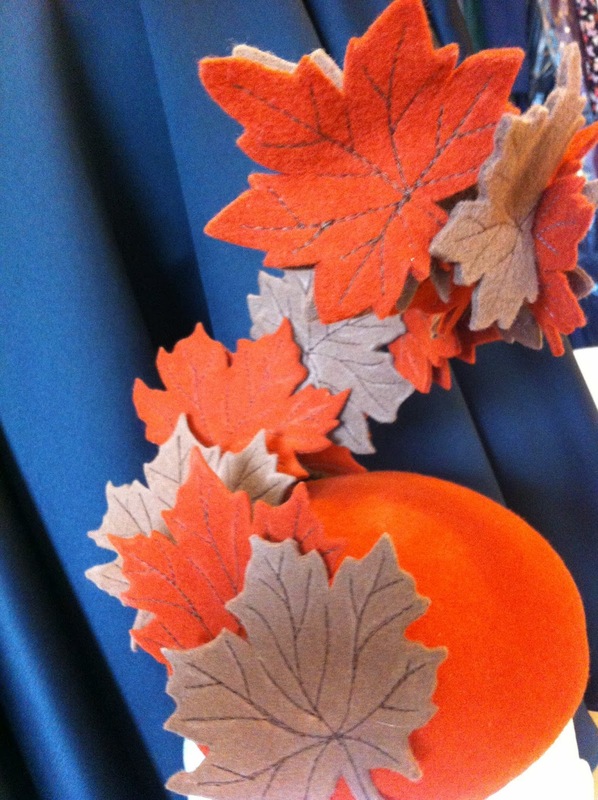 A while ago I made a felt button hat decorated with green leaves, and I always planned to make an autumnal version and I finally managed to finish it. I wanted them to be clearly linked in design, so I used the same button block, only this time in orange. 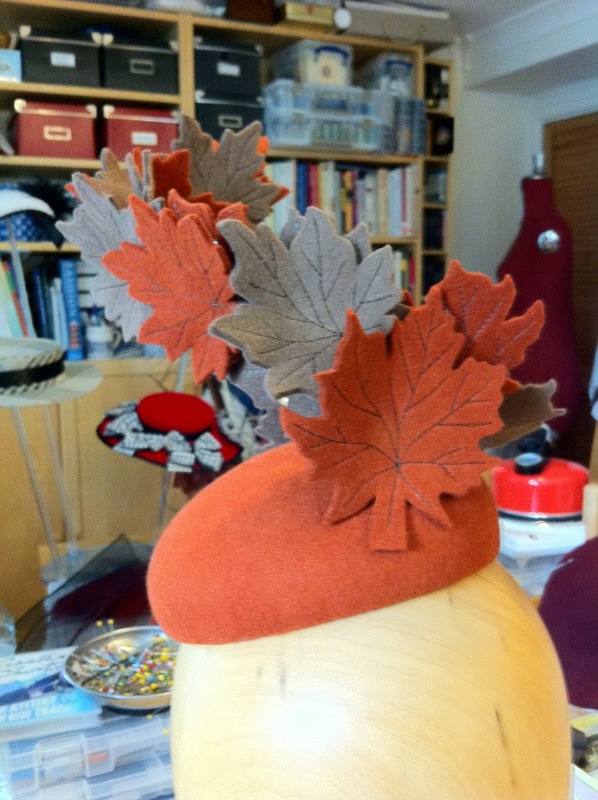 I used a maple leaf as my template for the felt leaves, as I've always loved the way maple leaves go such bright colours in the autumn. To make the leaves more lifelike I added free machine embroidered veins and shaped them to look slightly crumpled with one of my silk flowers shaping tools (which looks rather more like an instrument of torture!). 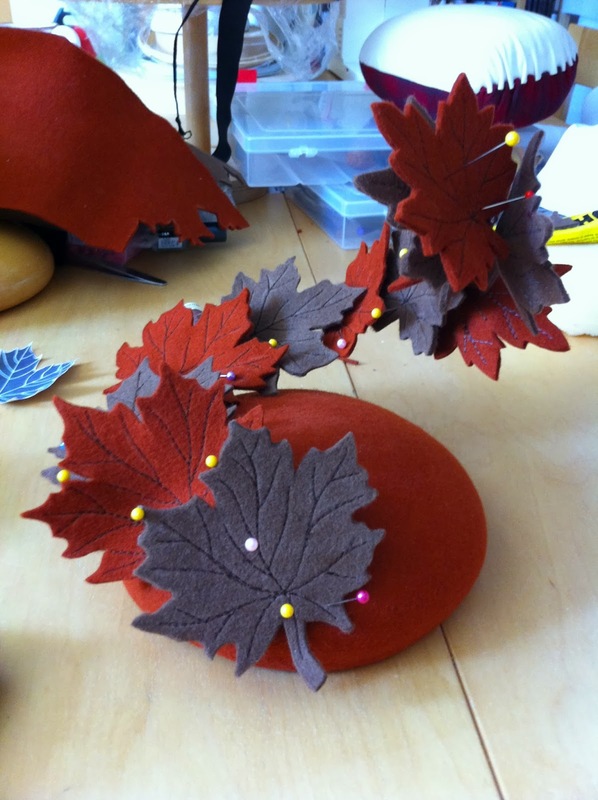 Another of my favorite arts of autumn is seeing leaves blowing about in the wind, although certainly not having to sweep them all up, and I wanted to get a sense of movement into the leaves as if they were blowing in the breeze, so I had to create a wire armature to attach the leaves to,which was strong enough to support them without being too obvious or bulky. 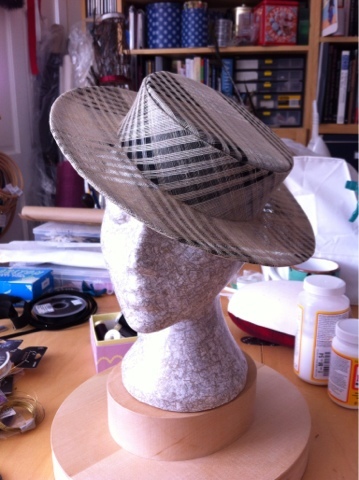 I think that this is one of the best hats I've made as its such an unusual design and it too quite a number or experiments before I got the armature to work the way I wanted- but it does work! 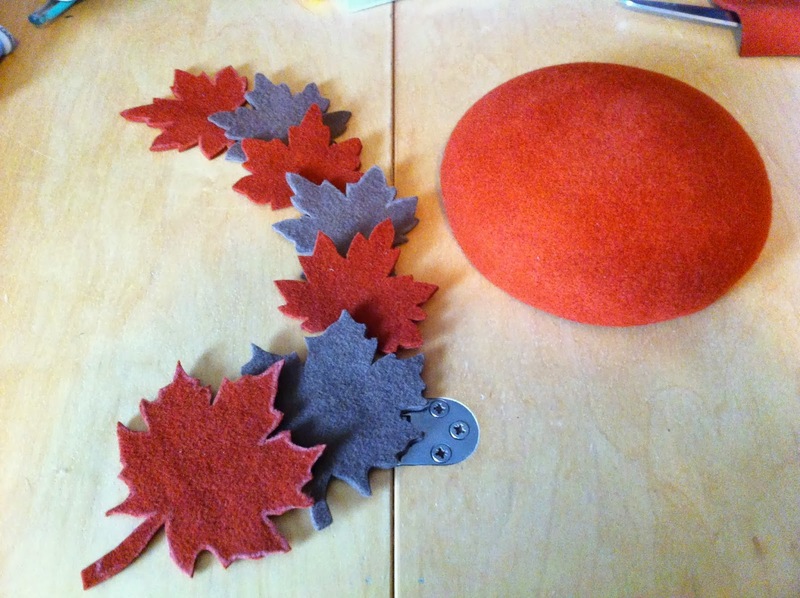 Felt leaves and a button waiting to be put together. 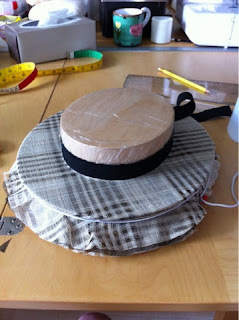 Leaves pinned together and you can't see the armature! Oh dear, I've been a bad blogger and not been keeping up with my blogging every week ideal... 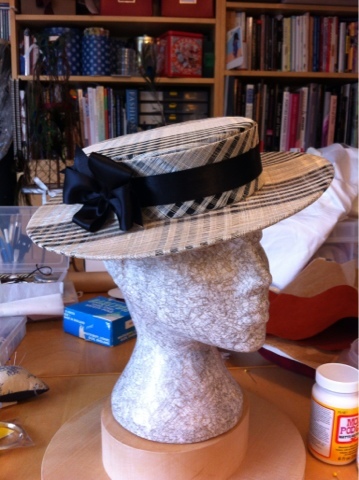 I'm back on the IVs again so this has at least let me catch up with this post about another hat I've made for the craft fair in November. As I said in my previous post about my mini red felt boater, my love of the boater is down to its versatility and the fact that it suits pretty much anyone. 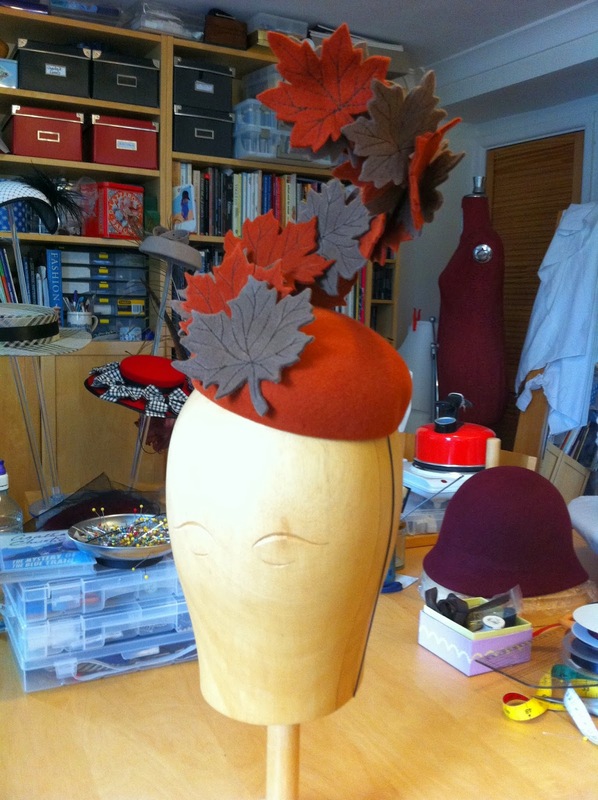 The block I used for this hat has a slightly smaller crown section than the head measurement, so that it can perch at a jaunty angle on the head rather than fit down onto the head. I bought the natural, window sinamay several months ago but wasn't quite sure how to use it. I asked on a milliners group page on Facebook and got lots of helpful advice, so I decided to use it in conjunction with black sinamay. The black is used underneath the window sinamay to emphasise the pattern of the windows. It's a bit more fiddly working with window sinamay as the sections with the cut outs are very delicate and tend to flop about! I blocked the hat in three sections- the brim, the band and the tip, and then sewed it all together by hand. 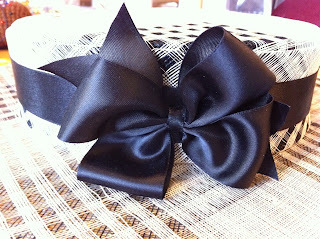 Because the sinamay has quite a complex appearance already I kept the decoration very minimal to not detract from it, just a simple satin ribbon band and a pinwheel bow for a little flirty touch. 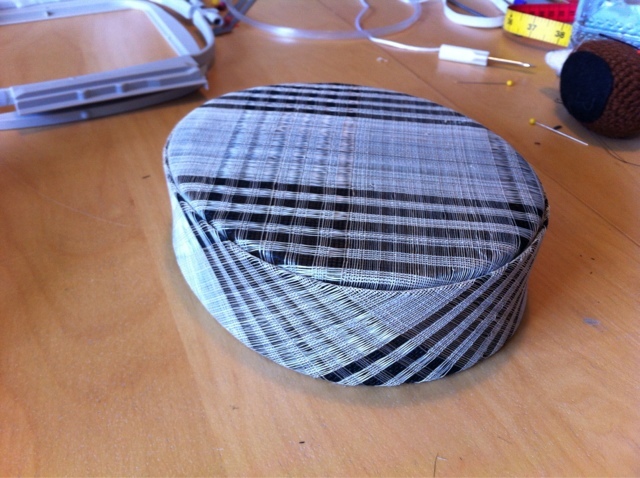 Blocking the brim. 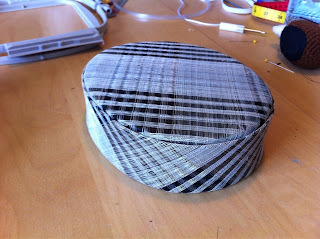 The block has a string groove to make blocking the brim edge easy. The complete hat sewn together.